Mine Duty 1.5 Pulleys from Superior Industries, LLC . Superior Industries Inc., a U.S. based manufacturer and global supplier of bulk material processing and handling systems, debuts their new patent pending Valor™ Vertical Shaft Impactor (VSI). The VSI is Superior’s second equipment solution for crushing bulk materials after launching the compression style Patriot™ Cone Crusher late last year. 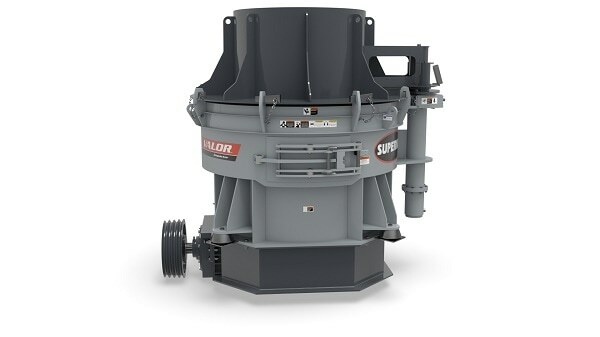 Impact style crushers, like the Valor VSI, produce a more cubically-shaped product. Incorporating criteria from several of its existing customers, Superior says its engineers produced a stronger, safer and more convenient design. For example, the VSI is equipped with a cartridge style, right angle pinion gearbox. This allows for a safer deck-mounted motor arrangement, which also simplifies access to the drive and its components. In addition, a hydraulically-powered lifting lid allows for safe and easy access to the crushing chamber. Maintenance inspectors are protected by a combination of automatic and manual safety interlocks. Thirdly, an innovative autogenous rotor design encourages more rock on rock crushing, which greatly extends the life of many internal parts. Superior manufactures models of its new Valor VSI for rates up to 800 TPH (725 MTPH) and maximum feed sizes up to 8-inches (203mm). Superior Industries engineers and manufactures groundbreaking, bulk material handling equipment and cutting-edge components. From its headquarters in Morris, Minnesota, USA, the manufacturing firm supplies bulk crushing, screening, washing and conveying systems for industries including construction aggregates, mining, bulk terminals, agriculture, power and biomass. In addition to its home plant in Minnesota, the 43-year-old Superior operates from additional engineering and manufacturing plants in Alberta, Canada; Arizona, USA; Georgia, USA; Michigan, USA; Nebraska, USA; and New Brunswick, Canada.